It will come as no surprise – given the radio silence of the last six months – that me and SWTOR blogging, we just haven’t worked out. I’m still playing SWTOR, I should note. And I’m still thinking about it, but it’s generally in the context of the rest of the MMO marketplace, and the other games I’m playing, and thoughts about the MMO genre in general. And in particular, crew skills in SWTOR have not turned out to be the deep and engrossing crafting system they promised us — at least, not by my standards of why I enjoy tradeskills or what makes a crafting system great. So. Rather than continue trying to beat a dead horse — which would end up with me resenting SWTOR and blogging (and probably the horse) — I’m bowing out gracefully. CrewSkills.net is officially retired. It’ll stay alive and in place, though, since some of the reference content may still be useful. However! You can’t shut up a blogger that easily. I still have plenty of thoughts about MMOs in general, including SWTOR, and I’ve been talking about them over at my general MMO blog, Siha Games! There won’t be crunchy googlebait guides over there, but I hope the content will be interesting, and I hope to see some of you over there. I really enjoy talking with the rest of the MMO blogging community, and I don’t intend to stop any time soon. Thankyou all for listening, and sharing SWTOR fun with me. See you around! …and scoring a Columi legplates token. I have a couple of (more substantial) posts in the pipeline but in the meantime, I just wanted to highlight a couple of great recent posts from around the traps. When to Bug Your Crafting Friends (or Alts) from Eltatorship. Perrin talks about the different classes of crafting mats and when each type of crafted gear changes mats. Companions List from Psynister’s Notebook. Psynister gives a great guide to all the companions by class, covering the romantic interests, the planet you find them, and their roles and bonuses. Super-useful! Link Love – Spreading the SWTOR from All For The Wookiee. 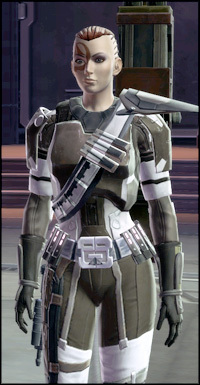 Kristalys gives an introduction to the rapidly-growing SWTOR blogosphere. Scary of Scary Worlds has a very entertaining take on PvP in SWTOR — and an argument as to why even people who don’t like SWTOR shouldn’t hope for it to fail. Go! Read, comment, think, enjoy! 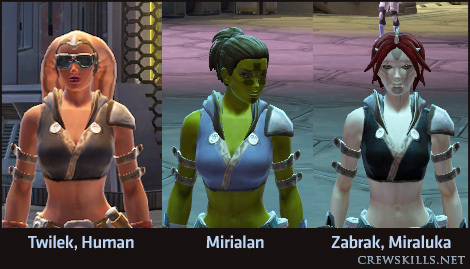 Generally, SWTOR is pretty good at avoiding the weird issue that plagues many other MMOs, where sensible armor on a man turns into ridiculous plate bikinis on a woman. However, I’ve found one partial contender – a case that’s so odd I can forgive it. Here we have the Amazing Chameleon Shirt, a.k.a the Temple Watchman’s Vest. This is the Medium +Strength chest purchasable with Tython commendations (and there’s a craftable custom armor equivalent, the Aspiring Knight’s Vest, which behaves the same way). On male characters it has long sleeves and wrappings around the waist, whereas on female characters it’s a sleeveless midriff top. However, its magical ability to change is even more pronounced than that! To wit, it changes colour depending on who’s wearing it! On Miraluka and Zabraks, it’s black. On Humans and Twi’leks it’s dark grey. And on Mirialans it’s a lovely powder blue. Unlike many other MMOs, SWTOR has hidden rewards for exploration and experimentation scattered all throughout its planets and game mechanics. One of the most popular of these rewards is the mighty Datacron. When you find a datacron it has the glowing quest triangle icon above it, though that doesn’t show up on the minimap, and using it will give you one of two things: either a small permanent bonus to one of your stats, or a matrix shard. Every planet has at least three datacrons; some have as many as five. Discovering a datacron also unlocks a new lore entry for your codex. Read on for more about datacrons, Matrix Shards, and how to make Matrix Cubes. Anyone got any others? Let’s get this party started! And here’s 50, a month after the game officially launched. Of course, my progress was slowed a lot by the fact that Bioware’s preferred downtime is usually smack bang in the Australian evening, i.e. prime playing time for us Antipodeans. Still, it could be worse: every SOE game I’ve played had daily maintenance, usually an hour a day at 9pm my time. 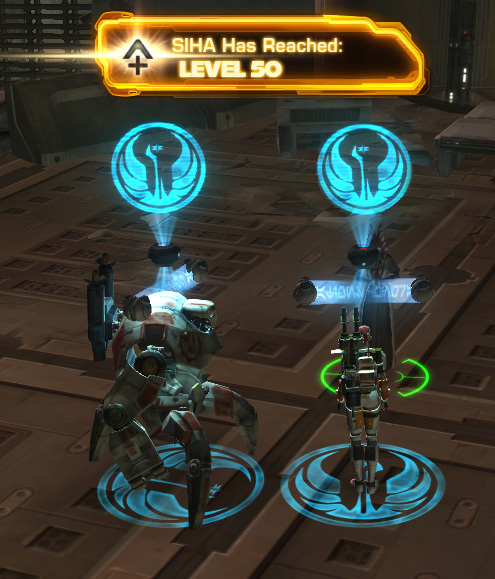 Siha’s progress to 50 was further slowed by my resolve to smell every flower I could find. I wasn’t deliberately avoiding levelling – and in fact I found soloing in SWTOR much more fun than in any previous MMO – but after six straight years of WoW and a fair bit of endgame burnout, I was in no hurry to race to Operations. It seems many of my guildies felt the same way – I’m only the eighth to hit 50. Now I’m looking forward to seeing what the SWTOR endgame offers, going back and polishing off all the bonus quest serieses (which I skipped at the time, except Tatooine’s), and wallowing around in a whole slew of alts.